If you search your ancestors in Forno di Zoldo, Veneto, info about your Italian family are stored in the City Office archives or at the parishes. In towns and villages of Veneto and in Belluno province registry offices were established in early 1800: it means that you could find information in Forno di Zoldo registrar as of that date. So, if your ancestors were in Forno di Zoldo in the nineteenth or twentieth century, then you could try to contact the City Office of Forno di Zoldo to know more. Before to start your genealogy research in Forno di Zoldo, we suggest you to read our tips for your search . They are useful to search in Veneto and in Forno di Zoldo too. 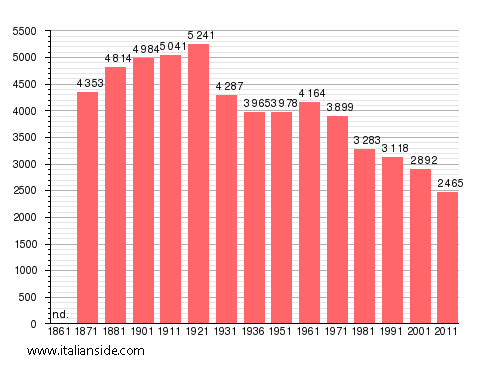 In the next picture you can see the demographic trends in Forno di Zoldo from the Italian Unification (1861). It could be important to know if the last name you are investigating is a frequent surname in Forno di Zoldo. As more your surname is common in Forno di Zoldo, as more it could be difficult to find the right info about your ancestors in Forno di Zoldo archives if you have not exact dates. Bernardi, Bianchet, Bogo, Bortoluzzi, Bortot, Bristot, Casagrande, Casanova, Cassol, Colle, Corso, Costa, Da Col, Da Rold, Dal Farra, Dal Magro, Dal Mas, Dal Pont, De Barba, De Bastiani, De Bona, De Bortoli, De Col, De Min, De Toffol, Del Favero, D Inca, Facchin, Faoro, Fontana, Fontanive, Ganz, Marcon, Mazzucco, Menardi, Rech, Reolon, Rossi, Sacchet, Sommacal, Soppelsa, Tabacchi, Tormen, Viel, Zanella, Zanon, Zatta. Church archives in Belluno province may instead contain even older information, but they are far less accessible from abroad (and almost impossible by email). If you have the opportunity to visit Forno di Zoldo and Belluno province, you could plan to investigate churches’ archives by yourself (or with us! ), but from abroad is very difficult to obtain any result unless you find a reliable local help. If your research is in a dead end and you need professional help from our local Italian genealogists write to fornodizoldo@italianside.com our expert in Forno di Zoldo area will study your request and will reply to you with a research plan and a quote. Your relatives mentioned above are in my family tree although somewhat distantly. Giovanna Campo, was the sister of Valentino Campo who lived in Westerly with his wife Oliva Zanolli. He was one of the first Zoldani to enter the U.S. in, 1891. Giorgio’s parents were Michele, (1834-1905) and Elisabetta Scussel. Michele’s parents were Giorgio and Maria Campo. Giovanna’s parents were Osvaldo and Arcangela Cercena. Your Giorgio had an uncle Pietro, (1835-1889) the brother of his father Michele. Pietro was married to Angela Scussel, (1832-1903). One of their children was Elena Brustolon who married Bortolo Panciera. Elena’s family was from the village of Pralongo, (a farming community) and her husband Bortolo was from Colcever. He was a fabbricator, (fabbro) who worked iron. Together they had 13 children, (one set of twins) of which 7 survived to adulthood. All 7 went to the U.S. They all remained in southern Ct, except for Pietro who went to Westerly. One of these children was Giovanna, (Jenny) Panciera who married Luigi, (Louis) Panciera. Luigi’s parents were Maria Bellante and Valentino Panciera. Maria was the sister of my great grandfather. Luigi’s family was from Astragal. Both Rebecca and Joyce who have posted below are in this same family tree. There is some mystery surrounding Giorgio. In, 1910 he failed the naturalization test. If he attempted to retake the test is unknown. According to a ship’s manifest he returned from Forno di Zoldo to the U.S. in August of 1915. World War-1 started in, 1914 and the Val di Zoldo was near the front line of battle. Between 1915 and 1918, Forno di Zoldo was occupied by Austrian troops. He may have got out just before the occupation began. He then went back to Forno di Zoldo during the occupation. He died on Feb. 25, 1917. According to his “death act”, (certificate) he was a resident of Forno di Zoldo. His brother Luigi, (born 1867) was the family witness and signed the form. It showed his wife as Giovanna Campo. Giorgio and Giovanna were married on Feb. 19, 1899. At that time he was 26 and she was 23. They had a son, Pietro Angelo who was born on Nov. 11, 1899. They also had a daughter Ida Giuditta who was born on Nov, 21, 1901. It’s been awhile. Glad to hear we are related! I have some info my dad mentioned that might help with finding who is related to my paternal great- grand parents. Luigi and Jennie both had Panciera as their last name before marriage. Luigi’s mom was Maria Bellante,I believe your great- aunt? Anyway, Jennie is the one I am having trouble getting info on. Her mom was a Brustalone. Her dad was a Panciera. They all came from Astragal. This is the info my dad gave me:apparently the families with the same surnames have an additional identification. Like a “clan” name to distinguish the two. Luigi Panciera was a “Danel” Panciera and Jennie his wife was a “Brique” Panciera. Sorry about the spelling since I wasn’t told that. Hope this helps; you have been great! Any Santins,Campos,Remor,or Lazerins in Meriden,CT? I’m probably distantly related. I realized I made an error in the above post. In the 2nd paragraph where I said, “when they were married Jennie, I meant to write Elena. Also Jennie’s husband Louis/Luigi was from Astragal. I am writing once again with another clue about my great grandmother, Mary Rose Campo. (She was most likely named Maria Campo but went by Mary once she immigrated) and also my great great grandmother, Rachel Lazzerin. (There are numerous spellings for the name Lazzerin.) hoping that someone can give me any information about mostly Rachel. I have found another piece of information out about her. On the passenger list in 1899 when her daughter Mary R. Campo immigrated she was about 14 yrs old she came over with 2 adults named Michele & Marina Chinatti. Marina was age 29 in 1899. They were a married couple. My research on Marina says that she was a Calchera before marrying. My own mother, age 83, who is still alive, grew up in Stafford, CT. USA and she has many cousins by the last name of Calchera still living there, and even after talking to some of them, none of them are old enough to remember someone such as Rachel who was 72 yrs of age in the 1940 census taken in Stafford, CT. I am now wondering if it’s possible that Marina (Calchera) Chinatti was possibly a younger sister of Rachel’s and that would make my great great grandmother, Rachel also a Calchera too. I might also add that in all of my research on the genealogy web sites the name Rachel does not seem to be a common Italian name and I’m wondering if this was a name she just went by once she arrived in the USA since so many names were changed and also the spellings too. I would appreciate any information about her as I stated in the request I sent a few weeks ago. Maybe the reason I can’t find anything about her is because her first name was not really Rachel. All I know is she was born in 1858 and also some info about her son Joseph Antonio Lazzerin and that she’s always listed as being widowed on the censuses. I found the information you are looking for and more. There is a connection to my family tree, although distant. So far I have not made a Calchera connection. Rachel’s birth name was Rachele, pronounced phonetically as, Rah kel lay and she was married twice. Her surname was Lazzaris. The correct spelling for Joseph’s last name is Lazzarin. Many who had this name spelled it Lazarin in the U.S. Maria was born on April 6, 1887. I also grew up in Stafford and knew a few Calchera’s. Today is March 14. Give me until Sunday evening and I will post the information I have found. It’s too bad they do not have an e-mail alert on this website. It would probably spur more interest. I have been building a genealogical tree starting with my family which has spread into Brazil and Argentina. So far I have over 1200 individuals. Most descendants in the U.S. do not know that the Zoldani people went to South America as well as the United States. I located the birth act for Maria Rosa Campo and Joseph/Giuseppe Lazzarin. I also found the death act for Rachel/Rachele’s first husband, Giuseppe and the act of matrimony for her and Beniamino Lazzarin. Maria Rosa Campo was born on 16 April, 1887. She had a sister named, Ida who was born in, 1885 and died during childhood. As far as I can determine, there were no other brother’s or sisters. Giuseppe Campo, (Maria’s father) was born in 1855 and died on 20 April, 1887, just 4 days after Maria was born. According to the record, he died in a hospital in Padova located in the region of Treviso. It is difficult to read the handwriting but I believe he was injured while working and never recovered. His parents were Giovanni Campo and Bortola Remor. As yet I have no info on anyone earlier than Giovanni within his family, however, I do know something about Bortola. Bortola Remor was born in, 1814 and died in, 1878. She was the daughter of Alvise Remor and Anna Maria Zampolli. Bortola had a sister Angela who was born in, 1808. She was married to Giovanni Bellante. All the Bellante’s who remain in Forno di Zoldo are directly related to Giovanni. If I have it correctly, Alvise and Anna Maria are your 5x grandparents. Rachele/Rachel Lazzaris was born in 1858 and the daughter of Maria Tiziani and Giacomo Lazzaris. She married Giuseppe Campo possibly in 1877. The only records found for children were Ida and Maria mentioned above. After Giuseppe died in, 1887 Rachele remained single until she married Benamino Lazzarin on 5 June, 1893. Beniamino’s parents were Giacomo Lazzarin and Maria De Lorenzo. Maria eventually moved to Belluno where she lived with her son Giovanni until she died in, 1910. She was born in Zoppe de Cadore. Giuseppe/Joseph Antonio Lazzarin was born on October 19, 1893. I was unable to connect Marina Campo/Calchera to your great grandmother’s family. There is no paperwork trail. There is some evidence that Antonio Campo who was married to Marina Bellante and lived in Stafford Springs was a cousin of your great grandmother. If your grandmother can remember any names of cousins that lived in Stafford, I might be able to make a connection. Rachele had a sister, Angela. She married Luigi Lazzaris on 1 March, 1896. They were both born in 1868. For the record, Luigi’s father was named, Giacomo and his mother was Giovanna Cercena. They did not leave Forno di Zoldo, however, it is possible that their children may have emigrated to the U.S. It appears that the Calchera connection is related primarily to the Lazzaris name. I found a Lazzaris/ Calchera marriage that went to Switzerland. I found another that went to Belgium. I also found a few that remained in Forno di Zoldo. That’s all I have for now, I am going to try and build a tree for Rachele. I think her grandfather Giovanni Campo may be a direct connection to my family. Do you have a family tree at the LDS website? Giovanna”Jennie” Panciera were my great grandparents.I would like to know more about Luigi’s mother’s family the Ballantes.I have not found anything Jennie’s family except I know her mom was a Brustalone.Also,I was told years ago by a lady named Ida Fontanella Fordiani that I was related to her because her mom was Mary Panciera.But there were 2 other Fontanella men in Meriden.One married Angelina Panciera,the other Lucia Panciera.I would like to know if I’m related to one of the Fontanellas.Thank you. I have a lot of information I can give you. There are a few things I have to check first. The mother of Ida, (Adelaide Maria) was not a Panciera. Her parents were Giacondo, (Joseph) and Maria Gavaz. Even so there still may be a Fontanella connection. I need to look into this farther. There may be some confusion. We are distantly related. Luigi’s parents were Valentino Panciera, (1852-1933) and Maria Bellante, (1853-1932). Maria’s parents were Domenico, (1820-1898) and Rosa Remor, (1824-1893). They are your 3X grandparents and they are my 2X grandparents. Maria’s brother Antonio was my great grandfather. When it comes to the Bellante and Panciera families, things can get quite intertwined. Looking at Jennie’s records I found another Bellante connection. At the moment, however, I still need to do more research. Do you know anything about Luigi’s brothers that came to the U.S.? Do you know anything about Forno di Zoldo? Luigi’s brothers:Oswaldo,Angelo,Henry. Jennie’s brothers and sisters:Ernest,John,Pietro,Mabele( or Michele),Philomena,Santina. My dad said we are related to Orsola Panciera. Do you know Rudy Fabretta from Tolland area? He is supposed to know a lot about the Pancieras of Stafford Springs, Stonington and Westerly,RI and he’s a relative. I gave some misinformation on my request. John Fontanella was married to Jennie Toscani. His father Sebastian was married to Dominica Panciera. I have some information you may find helpful. Giovanni/John was born, May 16, 1886. He married Giovanna Giuseppina Toscani/Jennie on Feb 11, 1910. They left for the U.S. the following March. Jennie was born Mar 20, 1891. Her father was Simione and her mother was named, Angela Coletti. John’s father Sebastiano, was born in 1840. His parents were Nicolo born, 1813 and Michela Campo. Sebastiano married Domenica Panciera who was born in 1844. Her parents were Antonio and Antonia Pra Mio. Sebastiano died on May 15, 1937 at the age of 96. Domenica died on Nov 1, 1928 at the age of 84. Nicolo, Sebastiano’s father died in, 1908 at the age of 95. Sebastiano and Domenica had a son named, Michele who was born in 1868 or 69. I believe he was the oldest child. They also had a daughter named Maria who was born in, 1874. I am sure there were more children. Sebastiano and his sons were all fabbros/metal fabricators. They may have had a family forge. They lived in the community of Astragal located within Forno di Zoldo. A lot of Panciera’s lived in Astragal. I have the names of Fontanella, Panciera and Coletti in my family tree. I still have relatives in Meriden, Ct. I hope the above information helped to answer some of your questions. We are interested in my father-in-laws grandfather Sebastian Fontanella. He was married to Dominica. They were from Forno Di Zoldo. There son was John who was born in Forno di Zoldo May 14 1886. His wife was Jennie Panciera also from Forno di Zoldo. Hi. My grandfather was born in Forno di Zoldo in 1880. His name was Antonio Santin. He died in 1943 in Bressanone. He had 6 children. Rosa his second youngest daughter was my mother. She was born in Chiusa in 1927 but later moved with the family to Bressanone. She married Osvaldo Pontarollo and moved to Toronto, Canada in 1956. I am researching my daughter-in-law’s family. Her Great Grandfather, Louis (Or Luigi) Panciera was born on April 3, 1886 in Forndo di Zoldo. He immigrated to the US about 1903 and lived in Meriden, CT. He died in Meriden, CT on FEb. 16, 1972. He was married to Jennie Panciera (same last name)who was also born in Forno di Zoldo on Feb. 12, 1890. She died in Meriden, CT on Oct. 30, 1995. Her parents were: Bortolo Panciera and Elena Brustolon. I don’t know who Louis’ parents were. Any help you can provide would be greatly appreciated. Thank you. I am looking for the family genealogy of the Bellante family. I think there were 2 or 3 more children. The family was from Forno di Zoldo. Antonio use to help at the local church as a care keeper. Are you related to Rosa Bellante, De Piero? 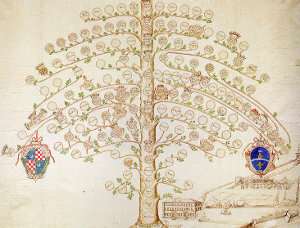 I have the entire Bellante family tree back to about 1680. I also have a lot of info pertaining to the surname origin and the link to Aragon nobility. Whatever questions you have, I am sure I can answer many of them. Juditta’s name was Giudita before she changed the spelling. She was born in 1866 and Antonio in 1864. At that time, the Val di Zoldo was part of Austria. Among the children, Lucia was born in 1891, Maria in 1893, Valentino Domenico in 1895 and Giovanni Sebastiano was born in 1900. The youngest were Domenico Romano born in 1903 and Rosalia was born in 1908. There were four other children who died young. There was also another sister, Genevre who is still a mystery. I think she was born in 1905. Feel free to contact me, I am sure I can answer most of your questions. Hello Jay, I saw your reply of November 23, 2015 to Rea regarding the Bellante family. I am researching the Panciera family and noticed on a ship manifest from the La Cascogne that aarrived in New York on Oct. 28, 1902, that Luigi Panciera was going to Meriden, CT to his Uncle Giovanni Belante’s home. Do you happen to have any relation in your Bellante family to Luigi Panciera, born April 3, 1886 in Forno Di Zoldo? In reply to your question about Luigi being related, I have no positive information that he is in my family tree. However, I think it is certainly a possibility. Several years back, I made contact with a distant relative in Italy. She made mention of a relative that was married to a Panciera. If I remember correctly, it was either Giuditta or Maria Bellante. This was early on in my genealogical quests and forgot about it. The Giovanni that is on Luigi’s manifest form is my great uncle and also the brother of Giuditta and Maria. From what I have found so far, Giuditta might be the correct sister. I have more information on this and will post it as soon as I can. I don’t know if you noticed but on Luigi’s manifest page is an entry for Osvaldo Panciera. If I read it correctly, he was also going tohis uncle Giov Bellante in Meriden. Perhaps Luigi and Osvaldo were related. I’m making headway with Luigi but there seems to be a problem with Jennie. There is no birth record for her using the date of Feb 12, 1890. Do you know of any other possible birth dates? Do you know her Italian first name? Did her parents remain in Italy? Have you found her ship’s manifest page? I believe that Luigi had at least 2 brothers and a sister, possibly more that came to the U.S. Does your daughter-in-law or another family member have any recollection of any of these siblings? Panciera’s were spread out between Stafford Springs, Stonnington, Meriden as well as Westerly, RI and northern NJ. I know Luigi was from Astragal, which is a township, (Frazione) within FDZ. If you can answer any of the above questions, it would help. Your request for information on Luigi Panciera helped me to unlock several mysteries within my own family history. I remember my grandfather telling me that we had cousins in Meriden. That was a long, long time ago. Luigi’s mother was Maria Bellante. She was the sister of my great-grandfather, Antonio. She also had a brother Giovanni Battista, (he’s the Giovanni on the manifest) She also had 2 more sisters Giuditta and Lucia. Maria was born, Mar. 3, 1850. She was the oldest of the siblings. I don’t have her marriage date at this time, however, she married Valentino Panciera. They were married in Astragal, (a community within FDZ) at the church Santi Fabiano e Sebastiano. Maria died Oct. 22, 1921. As of 2007, her gravesite was still in tact which I’ve been told is quite unusual because of it’s age. The genealogy for Valentino’s family before him can be found in the ledger book for the above mentioned church. His family page is, 151. Giovanna, (Jennie) Panciera, according to the Belluno civil registration records was born on April 12, instead of the third. She had a brother, Giovanni Battista, born in, 1886. I am not sure if he came to the U.S. She also had a brother Pietro, born in, 1881, who was in this country before Jenny. Here is another connection that is rather interesting. Today, there are descendants of Michele Bellante and Orsola Panciera that live in Meriden. Michele and Orsola left FDZ in 1896 and went to Westmoreland, Pa. Michele worked in the coal mines. Eventually, Orsola went back to Italy and Michele went to Nome, Alaska. After some time in the Klondike, he moved to Carbonada, Washington and Orsola then returned to the states. In 1914, they moved to Meriden which was their final destination. Michele and Luigi are related, however, it is necessary to go back 4 prior generations in their family trees to find a common relative. Orsola, however, was a much closer relative. Her mother was Lucia Bellante, the sister of Maria Bellante, (Luigi’s mother). Lucia was married to Venanzio Panciera. I hope the above information answers your questions. I am still looking for more connections to other relatives. I believe that Luigi had 2 brothers a Giovanni Battista and Osvaldo, along with a sister Teresa that were in the U.S. If I find something that I think might be of interest, I will post it. It’s always nice to find a few more cousins! I have been unlocking the mysteries of my family heritage for a little while now and came across this site. Much to my surprise, I think that your family information links up to my family information. My great-grandfather (Nino Valentino Cercena) was the son of Guiditta Teresa (Luigi’s sister) and Eugenio (John) Cercena. Giovanni Battista was Teresa’s father (as you already mentioned). I found some US Census information that says that the family’s last name was “Panciera”, but I also found information that shows their last name being listed as “Campo”. I would love to link up and see what information you have or see your compiled family tree. I have one as well that I would love to share. Take care. I am Rose and Herman’s granddaughter Jeannette is my mother. If you have information on the family tree that would be wonderful! If you would like to start a research in Forno di Zoldo please send your request to fornodizoldo@italianside.com.